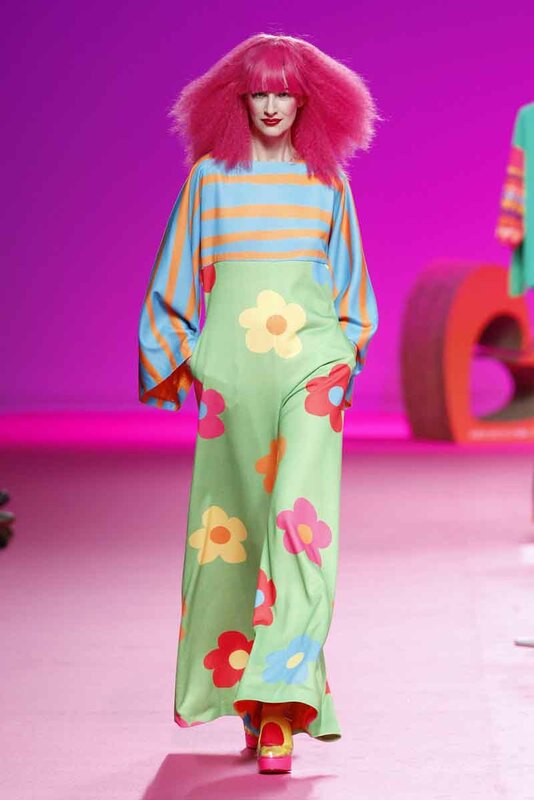 On Sunday, February 16, 2014, at the Feria de Madrid, Ágatha Ruiz de la Prada unveiled the Ágatha Ruiz de la Prada Fall 2014 collection during Mercedes-Benz Fashion Week Madrid. The designs of Agatha Ruiz de la Prada have maintained a constant theme since her first fashion show back in 1980: the inspiration of contemporary art, abstraction, surrealism, constructivism, expressionism, minimalism and pop art. The designer has reflected on all of these trends in her work, not only in terms of the conceptualization of ideas, which is fundamental in all of her collections, but in the sense that she has known how to translate them to the world of clothing through the employment of form, materials, color and the use of her classic icons, always based on the game of endowing her clothing creations with meaning and divesting them of it. This leads us directly to her use of graphics, something that she applies in an almost omnipotent manner in all aspects of her design and, above all, in her clothing prints. This Autumn/Winter 2014-15 Season is based on the idea of prints, providing the inspirational source behind the collection. Here we recover the classic prints of the 1980’s, the 1990’s and the decade that began in the year 2000, until we come across the new features for Winter 2014: spots, stripes, hearts, flowers, stars, bows, logos, rainbows, clouds and tangles of all shapes and sizes will inundate the catwalk this year. The prints have been made with a diverse range of techniques, ranging from classic checks and cylinders to sublimated prints that permit the use of a wide range of colors in a rapid, simple and economic manner, something that would be practically impossible to carry out in any other way. In this respect, color is the indisputable star of the season and the palette is enormous, starting with the primary colors and progressing to the secondary and tertiary shades, all intermingled, creating a minimalist Baroque sensation. This wide range of colors is combined with graphic elements of considerable simplicity, created on a varied selection of fabrics, such as the following: knits, felt, neoprene, satin, poplin, waterproof fabrics, crêpe and even printed sequins. The silhouettes are designed to create a comfortable and contemporary woman, with tight leggings contrasting with large oversize coats, straight lines standing against large curves and circles. Meanwhile, evasés and layers play around with all kinds of clothing sizes and lengths possible, creating a veritable puzzle when it to comes to dressing. Thus, this year the Agatha woman will enjoy a wider range of options than ever (if possible), based on long lengths, short lengths, tight-fitting formats … or everything together at the same time. “Color Prints” is a collection that encourages a sense of fun and play, a comfortable collection that promotes the recycling of clothing items, very much in line with contemporary trends. In short, the collection encapsulates the classic appeal that Agatha Ruiz de la Prada has brought us season after season since the fashion house was founded, aimed at the woman who is entirely FREE.